For me, wood sorrels are a group of plants I usually have to look down to find. This is certainly not the case for Oxalis gigantea. Native to the coastal mountains of northern Chile, this bizarre Oxalis has forgone the traditional herbaceous habit of its cousins in exchange for a woody shrub-like growth form. 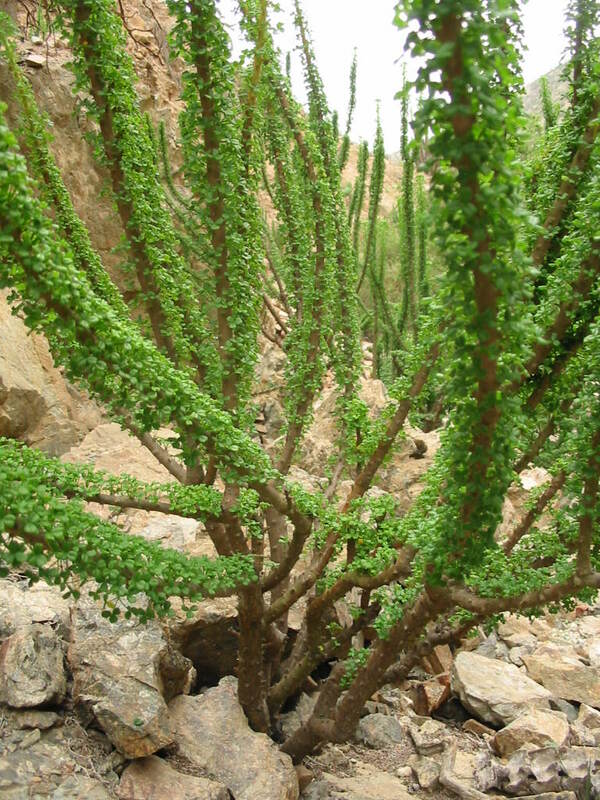 When I first laid eyes on O. gigantea, I thought I was looking at some strange form of Ocotillo. In front of me was a shrubby plant consisting of multiple upright branches that were covered in a dense layer of shiny green leaves occasionally interrupted by yellow flowers. You would think that at this point in my life, aberrant taxa would not longer surprise me. Think again. O. gigantea is one of the largest of the roughly 570 Oxalis species known to science. Its woody branches can grow to a height of 2 meters (6 feet)! The branches themselves are quite interesting to look at. 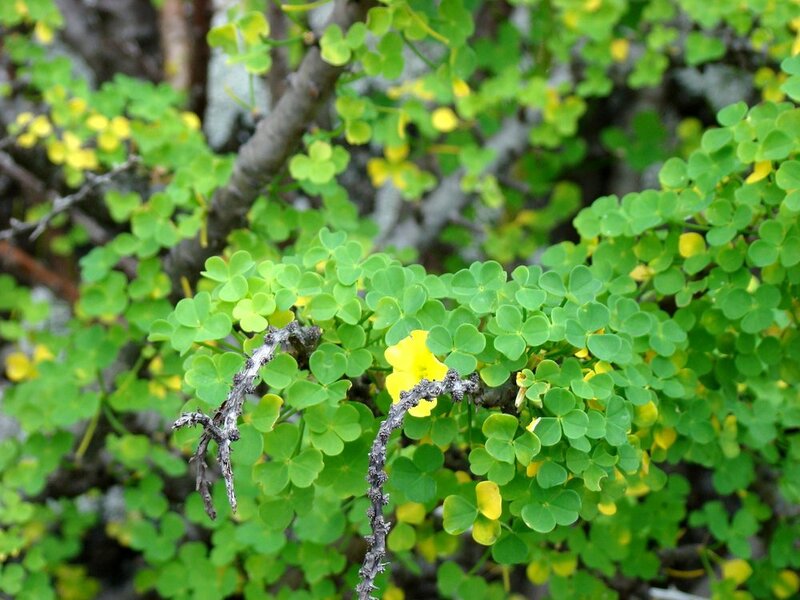 They are covered in woody spurs from which clusters of traditional Oxalis-style leaves emerge. Each stem is capable of producing copious amounts of flowers all throughout the winter months. The flowers are said to be pollinated by hummingbirds but I was not able to find any data on this. 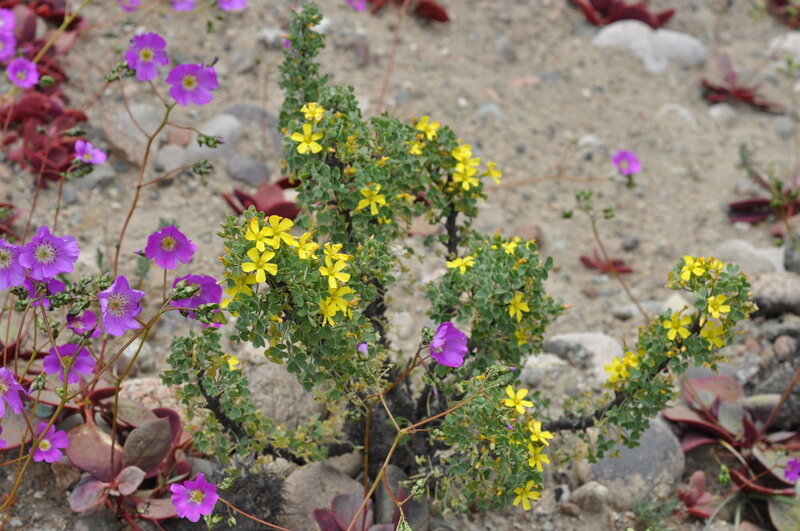 This shrub is but one part of the Atacama Desert flora. This region of Chile is quite arid, experiencing a 6 to 10 month dry season every year. What rain does come is often sparse. Any plant living there must be able to cope. And cope O. gigantea does! This oddball shrub is deciduous, dropping its leaves during the dryer months. During that time, these shrubs look pretty ragged. You would never guess just how lush it will become once the rains return. Also, it has a highly developed root system, no doubt for storing water and nutrients to tide them over. O. gigantea has enjoyed popularity as a horticultural oddity over the years. In fact, growing this shrub as a container plant is said to be quite easy. Despite its garden familiarity, O. gigantea is noticeably absent from the scientific literature. In writing this piece, I scoured the internet for any and all research I could find. Sadly, it simply isn't there. This is all too often the case for unique and interesting plant species like O. gigantea. Like so many other species, it has suffered from the disdain academia has had for organismal research over the last few decades. We humans can and must do better than that. For now, what information does exist has come from horticulturists, gardeners, and avid botanizers from around the world. The rosulate violas of South America are amazing. Adapted to the harsh, windy environment provided by the mountains of Chile and Patagonia, these little plants are as tough as they are beautiful!